These days are really exciting: Tomorrow at 9:00 PST (18:00 CET) Phil Schiller, Senior Vice President of Worldwide Product Marketing bei Apple, will begin his keynote at MacWorldExpo … and today CompareMe, the first codedifferent iPhone application is released at the iTunes AppStore! The financial utility app is used to compare, convert and negotiate prices or bargain. 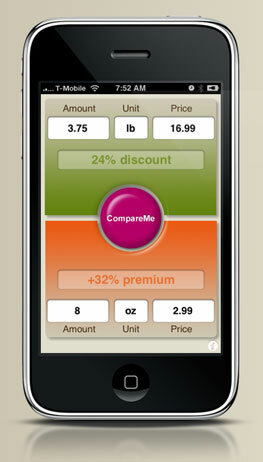 The app makes use of touchscreen gestures to convert or drag and drop prices. But let’s cut the long story short: Click on the video at the CompareMe application webpage to get an impression of the look and feel.